The Balinese are known for their arts - music, dance, batik, etc. 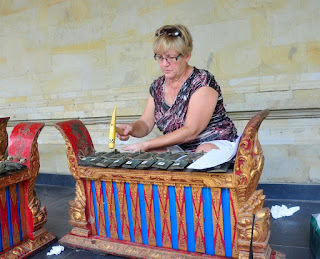 I've always been interested in the music of other cultures so when Bev (our tour arranger) mentioned some of the optional activities we could take part in I immediately thought I'd like to do some gamelan playing. 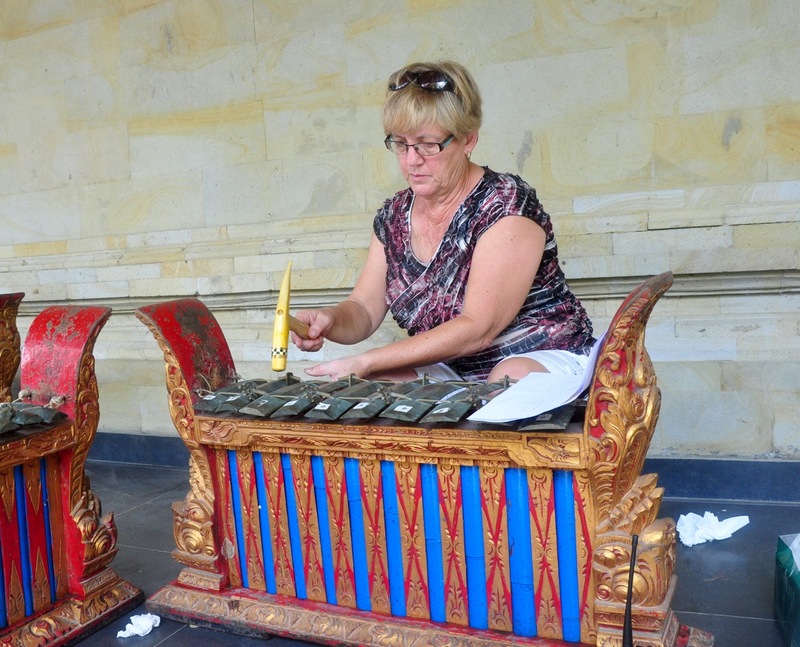 The gamelan are basically metal xylophones, usually played in orchestras with various sizes. So this morning I ventured off to the local arts museum for a lesson. My instructor was very patient and I must say playing the melodies was quite simple. The difficult part was the dampening. Because they are metal and resonate loudly, while you play one note with your right hand you need to dampen the last note at the same time with your left hand. To get a sense of the difficulty imagine playing the melody with your right hand and simultaneously playing the same melody with your left hand, only one note behind. The coordination required was very taxing on my brain and half way through I was dripping with sweat. 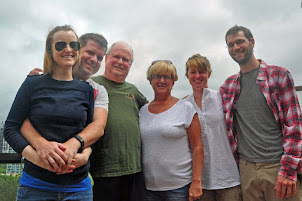 The 100% humidity didn't help. Following that, Mel and Larry from the group joined me for the Balinese flute lesson which was a breeze comparatively - the fingerings and technique are almost identical to recorder and our teacher was very patient with Mel and Larry who tried their best. In the example below, the repeated notes are dampened to create a short rhythmic sound so it was a bit easier. Thank you for taking me along on your adventure!! Have fun!!! !